UPDATE: We are sad to report that after having served our community for two years, the Samara Supermarket has closed. During our two-month absence from home this summer, Doug and I returned to find new businesses popping up around us - a very good sign. Our first discovery was that a formerly closed Winn-Dixie supermarket has been completely revamped with a fresh, appealing look. With its new carving stations, cheese store with cheese and wine experts, in-house chef, fresh sushi, free coffee and free Wi-Fi, Winn-Dixie will rival even the snazziest Whole Foods or Fresh Market. 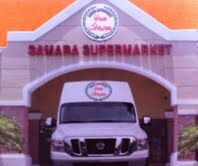 What truly got our hearts pumping is the opening of the new Samara Supermarket in Boynton Beach’s shopping corridor. FINALLY, a Middle Eastern store close enough so that we don’t have to make a day’s trip out of buying ingredients we need to operate The Armenian Kitchen. We found Samara by accident while perusing a local advertising publication. This prompted an immediate trip to examine their wares and determine whether or not the store would meet our needs. The answer: yes, it would! Samara is a spacious store owned by Khaled (Ken) Samara. Ken was inspired to open a Middle Eastern store in central Palm Beach County because he saw a need for one in this location. 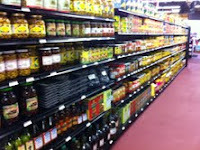 The shelves are neatly lined with canned, jarred, and packaged products – bulgur, lentils, olives, Noyan preserves from Armenia, red pepper paste, and so much more. 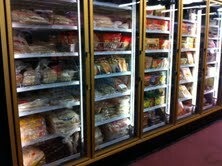 The refrigerated and freezer sections contain a variety of cheeses including Armenian twisted cheese (Karoun and Gharibian brands), lahmajoun, phyllo and kadaiff dough - to name a few. There is a small fresh produce department featuring eggplant, Persian cucumbers, pomegranates and such. What really surprised us was the fresh (Halal) meat counter complete with a butcher. 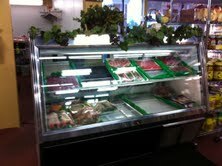 There was a lamb carcass hanging in the refrigerator, and a lamb’s head displayed in the meat case – pacha, anyone? And cow hooves – Mmmmm, khash! Need hookah paraphernalia? Ouds? dumbegs? They're here, too! Ken was was quick to mention that customer satisfaction is important to them, and if we didn’t see a product we wanted, let him know and he would order it. We liked that aspect very much. Ken is already looking forward to the store's expansion. He's planning to install an oven for making freshly baked pita bread, and adding a kitchen so food can be made on-site, such as stuffed grape leaves, spinach turnovers, za'taar bread - you know the menu. All we can say to Ken is: WELCOME to the neighborhood! Makkah Market is one of the few super market offering the best middle east food like shish kebabs, falafel sandwich etc. in Philadelphia, with the excellent taste and quick assistance.